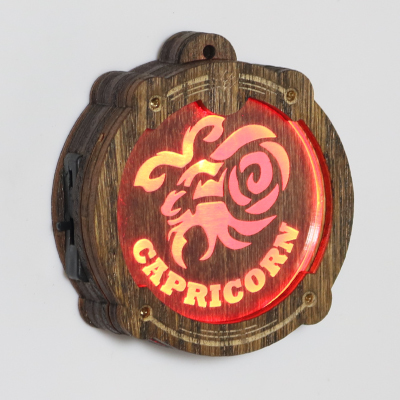 One of our mystical zodiac symbol Amulights. Perfect as a gift! All Amulights are approx. 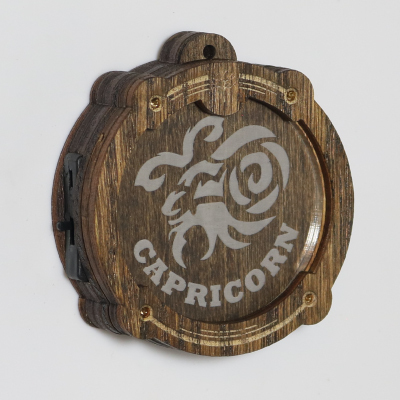 2.3” diameter and 3/4” thick, and are made from layered, sustainably-sourced oak assembled with custom-developed electrical and LED components. Amulights automatically cycle through a full rainbow of colours indefinitely until you turn them off. With an on/off switch and replaceable watch batteries, Amulights will keep you on the glow for years to come. Your Amulight will come with a synthetic black cord – use it for wear as a necklace, or replace the cord with another clip of your choosing using the small hole at the top of the Amulight.